Editor’s Note: This article, written by our teacher Rav Berg, was previously published in the Summer 1999 issue of Kabbalah Magazine (volume 3, issue 3), though considering the current state of affairs, we find it is perhaps more relevant now than ever. This very small and, for millennia, insignificant piece of property takes up a great deal of space in the newspaper and has the major nations of the world caught up in the politics and internal affairs of its inhabitants. For the most part, the people of these other countries could not really care less about becoming embroiled in the intrigue and personal business between the Jew and Arab that has emerged in the Middle East. Why should they? What relevance can the outcome or solution to the Jewish-Arab struggle have for the other nations of the world? What drives the leaders of these governments to become involved with what is going on there? Why should they pay so much attention to a matter that, on the surface, has not materially affected the ongoing lives of themselves or their people? We can understand the involvement by these nations when the conflict affects the welfare or economy of the entire world. However, there is very little disagreement as to its non-influence upon or non-disruption of the internal affairs of other nations. Whether Israel and the Palestinians ever come to an agreement will have little bearing upon their governments. And yet they persist. Furthermore, when have we witnessed such interference in a country where the victor is placed in a position of having to respond, as Israel has many times in the past, to accusations as an aggressor? Very rarely The United States answered to no one in their occupation of the various territories within the continental U.S. The Indians were driven from their lands without so much as a whisper from other countries. Russia was never called on the carpet when seizing land all around the Asian continent. There has been no real foreign intervention in the Northern Ireland affair or intrusion of mainland China into Taiwan. One does not read about foreign envoys making a trek to resolve these disputes. Hopefully, the participants will work it out by themselves. But Israel is different. Why? One other important point has been raised that I have been requested to respond to: the question as to whether there can be real peace between Israel and the Palestinians and the other Arab nations. Never having even publicly voiced any political preferences, and never claiming to be a prophet or the son of a prophet, my response with either a “yes” or “no” would be most inappropriate. This is not the Kabbalistic approach to solutions or predictions. What is necessary is a deeper understanding about the Land of Israel and why the Israelites were chosen, as stated in the Bible, to become the occupants of this land. If indeed the Bible is the source reference for the legitimate right of the Israelites to own this piece of property, then I would like to raise a very serious question that I heard many years ago from the Saudi ambassador to the United Nations. If the Jews refer to the Bible as their divine deed to this piece of real estate, then the ambassador asked the rather simple question as to legitimacy of their claim to the Holy Land of Israel. In as much as approximately 85 percent of the Jews around the world do not consider the Bible as the absolute guide for their lifestyle and reject much, if not all, else mentioned in the Bible, then why do Jews find it to be in their lexicon to refer to this property as the Land of Israel? Do United States citizens call Texas the legitimate property of Mexico? Have the Indians been permitted to demand their land back because they were there before the white man? To accept the divine guidance and declaration of God when it comes to this land belonging to the Jews but to reject parts or all of its other content does smell somewhat of hypocrisy. Furthermore, the Jews of the world are not clamoring to go and live in Israel. There are even some who claim that a great number of Israelis living in Israel might prefer to live elsewhere, as the reality seems to indicate. The argument has been presented that since the Jews have no place of their own, then why not Israel. Well, the Arabs feel that Theodore Herzl’s idea of creating a homeland in Madagascar might not have been a bad idea. The Jews have been hounded and persecuted over the millennia; therefore Israel seems to be a perfect place to finally put to rest the question as to why Israel must be the Jewish homeland. How this legitimizes the Jewish claim is beyond me. I can certainly understand the Arab position on this argument, but I am not sure how many Jews could come to grips with this reasoning. One begins to understand the confusion surrounding this burning issue. All of the above positions do not really get to the heart of the matter, and consequently, it behooves us to probe much deeper into the statements in the Bible, which all major religions claim as their source. A good starting point for our investigation is the Zohar, which considers the Bible completely abstruse and couched in mystery. It was the task of Rav Shimon bar Yochai to decodify the Biblical content. So let us now examine one peculiar aspect that the Zohar considers, and that is: Why have all the great and huge empires found it necessary to conquer and rule this tiny land on earth? Just what did these emperors have in mind when they fought over the right to rule? Jerusalem has been noted as the Holy City. Is it because the Holy Temple was located there? The Kabbalistic retort to this kind of reasoning is: Why was the Holy Temple located in Jerusalem in the first place? The physical expression of the Temple cannot determine underlying causes, inasmuch as we are left with the question: What brought about the Temple site in the first place? The Zohar documents the link between the Temple and the City of Jerusalem. The initial reason for the Temple’s location is related to the energy center of the universe abiding in the Land of Israel. The Zohar tells us that the Temple and the Ark within the city of Jerusalem were collectors and conductors of cosmic energy-intelligence. When a circuit of energy flowed, the universe and all of its infinite galaxies were in harmony and violence did not exist. The Temple of Jerusalem reflected something entirely different from the temples of other ancient peoples. What happened in Jerusalem affected everything on Earth and in the cosmos. Jerusalem was considered to be the nucleus around which all galaxies revolve. As ridiculous as this may sound, conditioned as we are by the narrow contemporary view of science, Jerusalem did not, nor does it now, represent some religious ideology. Physical structures merely symbolize a metaphysical thought energy-intelligence and portray its internal realm. The body represents the internal soul consciousness of humankind. The body is the secondary force. Our soul energy-intelligence is what motivates the body consciousness. The sooner we come to this realization, the better the possibilities for reaching meaningful and lasting solutions to our problems. The present approach to problem-solving has done little to provide for the objectives necessary to enhance the wellbeing of our society. Superficial reasoning in determining cause and effect is a convenience of the five senses. This reasoning permits us to sit back comfortably, thinking we have worked things through. Every avenue must be pursued in determining primary causes, despite sometimes frustrating efforts to get to the “bottom of it all.” The entire spectrum of quantum reality must be researched before we can come to any conclusions. The answers to the final “why” provides the ultimate cause, and that final definitive cause is our gateway to problem-solving. How did this piece of property become known as the Holy Land? To connect this designation to the Holy Temple being located there would be as incorrect as the usual explanation that Jerusalem is known as the Holy City because of the presence of the Temple. The word holy might aptly be regarded as “wholly,” indicating the ultimate balance of energy known as the Lightforce of G-d. The Holy land is the energy center of the world and encapsulates the awesome power of the Lightforce. Who are these people called Israel? Why have they stamped such an extraordinary impression on the universal stage of history, indeed a mark out of all proportion to their numbers? “The people of Israel maintain the most intense degree of the Desire to Receive of all other nations of the world,” states the Zohar. This level of Desire to Receive provides the opportunity for the maximum expression of the all-embracing Light of Wisdom. In a manner similar to the way a light bulb draws power according to the restrictive capacity of its filament, the degree of Light manifested by man depends upon the ability to restrict and thus draw that sublime cosmic energy. This is the nature of the Jew. And the region through which the maximum energy reaches our galaxy is the level of consciousness known as Land of Israel. The universe is a message written in a cosmic code, which is the Zohar’s task to decipher. Revealed through this cosmic code is a celestial order beyond our immediate rational experience. When the scriptures refer to the region of “the land of Israel,” it is to indicate the invisible realm of consciousness. The Zohar exposes the existence of the internal cosmic forces that shape the human condition and control the physical universe. When considering the Zohar’s description of the Land of Israel, it is fascinating to examine the relationship between the Land and the rise and fall of former empires. The Parthian Empire of Cyprus, for example, reached its peak when Cyprus overran the Land. A similar destiny awaited the Babylonian, Greek and Roman Empires, and, more recently, the Ottoman Empire. The most contemporary example of this extraordinary pattern is the British Empire. Astonishingly, each empire reached the peak of its international influence at the time when it ruled over Israel, and each measured its decline from the time it lost possession of the Land. The intrinsic, internal dynamics of the Land of Israel parallel exactly the intensity of the Desire to Receive of Israel’s people. The particular cosmic intelligence generated by this land seeks its own level of receptivity. Positive energy desires to Share. The people of Israel sustain this by generating the highest form of the Desire to Receive, which is the Vessel for the revelation of Chochmah, the Light of Wisdom. The capacity of Israel’s Vessel corresponds precisely to the degree of energy flowing forth from the land and to the intensity of energy that its Vessel can adequately handle. For this reason, the region has been known as the Land of the People of Israel --a code for the interconnectedness of the people and the Land. Now we turn to examine the designation by which the Land of Israel has become closely linked with the Holy Land. Following the destruction of Shiloh (c. 1050 BCE), a central Temple was needed. The military defeat suffered by the Israelites at Eben-Ezer, which resulted in the capture of the Ark by the Philistines, brought about a severance of the Ark from the altar. David finally brought the Ark back to Mount Zion where he erected a tent for its safekeeping. Scholars are divided as to why the specific mount in Jerusalem was chosen as a resting place for the Ark. The main issue is whether the spot selected for the altar was also the place that tradition had identified as the site of the binding of Isaac. Another factor in choosing Jerusalem as the site was its territorial independence. As a newly conquered city, it had not been incorporated into the territory of any one tribe. By its very nature, it, therefore, was the one and only place likely to satisfy the claims of every tribe. The mystical significance of the cosmos was well known to all ancient cultures. Temples, monuments and religious teachings stand as testimonials to the influence believed to have been exercised by the heavens over the daily lives of men. The ordered structure of the cosmos was thought to symbolize the metaphysical workings of the celestial realm. However, the ancients considered the heavens to be the domain of the gods and the earth and man were seen as being utterly insig­nificant in the vast scheme of the cosmos. The ancient Israelites believed otherwise. The Earth, rather than being just one among countless billions of celestial entities scattered throughout the universe, was actually the center of the universe. The Temple, structured in such a way as to provide a proper channel for this cosmic energy, was thought to give nourishment, peace and prosperity to all inhabitants of earth, and even to the extraterrestrial intelligence throughout the cosmos. The Ark of the Covenant was the instrument which drew the supreme source of energy-intelligence. Celestial entities were believed to be governed by the activity of man. Thus, instead of being pawns in the cosmic scheme, as other ancients had believed, the Israelites considered man to be the prime interface between the terrestrial energies and the celestial forces of the metaphysical domain. And only when the forces were in balance did the heavens declare their majesty and influence. This is precisely why great empires sought the Holy Land. On a rational level, there was no valid reason for them to be concerned or occupied with this insignificant parcel of land. However, as emperors with an insatiable desire for dominance, they were driven by the lure of a powerful cosmic energy location, which their internal essence understood and sought after. 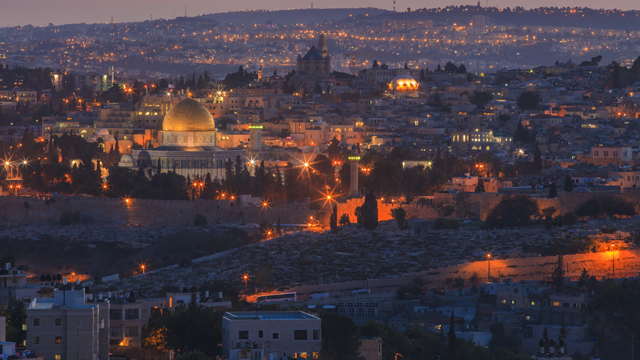 With this penetrating background to the Middle East, Israel and the Jew, a great deal of light has been shed on some of the questions we raised at the early part of this article. The future of mankind, and the Jew in particular, will greatly depend upon the attitude and behavior of the Jew toward his fellow Jew in particular and toward mankind in general. If the majority of Jews continue to behave in a manner described in the Talmud, then the Jew and the rest of the world will be subject to chaos. The Talmud states that the First and Second Temples were destroyed for no other reason than sinat chinam, “hatred for no reason”. There was no respect or consciousness for human dignity. Does this imply that only the Jew fails to display insensitivity and other nations of the world do? This would obviously be an incorrect statement. However, because of the internal composition of the Jew, a negative action has far more devastating consequences than if the same action were taken by others. And by the same token, violations of the universal code of behavior by a Jew can and will spark the flames of violence in our society. This contributed – and still does – to the unnatural and non-rational hatred or anti-Semitic feelings generated by some non-Jews. There is something internal that urges the anti-Semite to express his venom but without a corresponding explanation to this behavior. As one who has spent a great number of years in Israel, I have come to understand the society of Jews. Inasmuch as the disciplines of Kabbalah stress the importance of ”no judgment” , in no way should the following imply my personal feelings or opinions concerning Israelis. Nor should what I have to say on this subject indicate a sense of frustration or hopelessness. I believe I am stating a matter of fact and, even were there to be disagreements on this subject matter, I would still fall back on what the Talmud has to say insofar as the existence of chaos and destruction is concerned --Jewish insensitivity and intolerance towards each other remains and will always be the origin for chaos amongst Jews and between Jews and the other peoples of the world. What seems to be very prevalent in Israel at this time is the intolerance – and some­times even hatred – that Jews demonstrate towards each other. This condition of chaos will always be the evidence that we Jews are still living with a consciousness of hatred. Were this consciousness to be removed, then the result would be the removal of chaos from the face of this earth. Religion apparently has not sent forth the proper message. People are hurt, maimed and even murdered in the name of God. It is precisely for this reason that peace cannot exist between the Israeli and Arab as long as Israelis do not display compassion, nor do they behave in a compassionate way towards each other. While it sounds too simple to be true, individuals dropping their animosity and acquiring a tolerant behavior is all that is needed to achieve a life free of chaos, war and strife. Amen.